I want to be totally straightforward and tell you that I am not yet the master of this art. My sophomore year of college, I absolutely wet the bed at NCAA Championships. All of the end of sophomore year actually was a total disaster. I never won NCAA Championships. Every. Single. Major. Championship of my career so far (save one) has been incredibly disappointing, but weâ€™ll get into the successful one and how my brain was different in a bit. Not until 2018 did I feel like I truly performed when I was supposed to, and a new, happier, more relaxed training and coaching situation is a huge enormous reason why. The only differences between training and competition are the uniform, venue and the number of people watching! The implement weighs the same. Youâ€™re competing with the same teammates if youâ€™re in a team sport. The play book doesnâ€™t suddenly change. You are usually wearing the same shoes. You might do your hair differently or drink a little extra coffee before heading to the stadium, but youâ€™re focused on executing the same positions that youâ€™ve practiced over and over and over again. The X factor in a competition that I used to get hung up on is the fact that people are watching. Expecting. But once I figured out that those spectators werenâ€™t waiting for me to fail, but instead were there for the same reason I was (to experience something amazing), their attention instantly turned positive. There are other X factors. Maybe your own expectations are the ones that get you all nervous. Perhaps thereâ€™s that one competitor that always just edges you, and it drives you crazy. You could be hoping to perform well enough that you get to travel with your team for the next weekend. All completely valid worries, and all things you can practice overcoming. Keep everything as normal as possible. There is so much that goes on around big competitions that elevates you anyway. You donâ€™t need to do anything extra at the last minute. You are enough! So many times, I have overthought and overstimulated myself going into an important meet. Some of my very, very best performances have come when Iâ€™m jarred out of my own head by something unexpected, and forced to just rely on the tools I have. At NCAAs in 2008 I was SO nervous that I just barely made the final, and then ended up 5th even though I led not only the collegiate system, but the country. 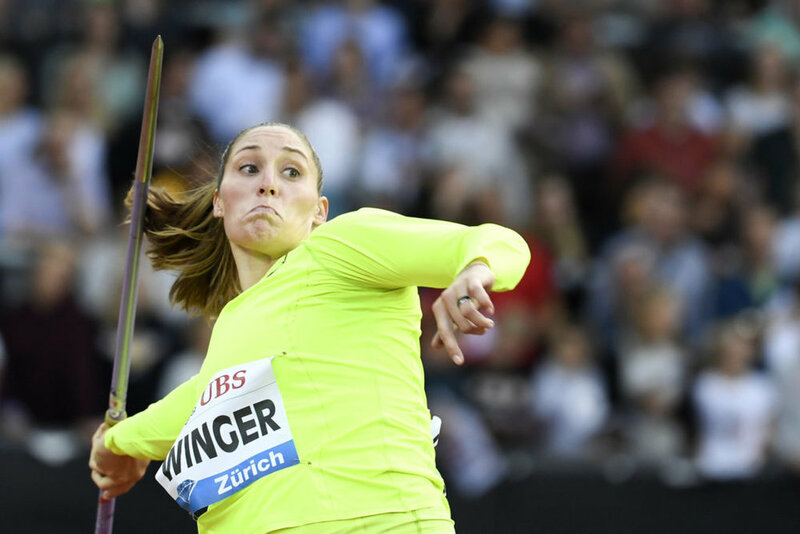 In 2009, I tried SO hard in the qualifying round of World Championships in Berlin and put so much pressure on my first professional Team USA performance that I only threw 52 meters. My 2011 season was absolutely riddled with sub-par results from a crippling lack of confidence. That terrible season had some other causation, but the mind can be very powerful in both directions. In 2008 at Big Ten Championships, I fell hard on one of my last warm-up attempts. I sprained my left wrist in the process, plus I was pretty darn embarrassed. I was not leading the Big Ten at the time, Ruby was, so I had been super serious and too focused during my warm-up process and in my whole approach to the meet. After I fell, all I could think about was how much my wrist hurt and all I could focus on was the careful and deliberate placement of my feet so that I wouldnâ€™t fall. Turns out, that careful focus meant I got my left down quickly, and that plus adrenaline (and great preparation by Coach Zuyderwyk) meant I threw 61.56m, the Olympic A standard. I just needed something to shake me loose. Your body already knows that you are approaching a big meet when itâ€™s coming. Drink lots of water, get lots of sleep, and if you need to visualize throws, keep it very simple. Stick to the cues youâ€™ve used in practice recently that have worked rather than thinking up something new before the big show. Trust yourself, your coach and your process. Iâ€™ve had a lot of opportunities to perform on big stages, and messed it up many times. Iâ€™ve just been lucky a few times to have things happen that get me out of my own head and let fun performances happen. After months of a new training program, new technique, and a season of fabulous European experiences in 2018, I spent four days alone in Prague before traveling to Zurich for the Diamond League final. I love being alone actually (to an extent), and I simply drank water, slept, read books, trained, and visualized my perfect javelin throw at that point. I didnâ€™t let myself think about it ALL day. I didnâ€™t have access to the internet where I was staying, which was perfect. I hibernated and focused on my goals, but also just chilled, like normal. Arriving in Zurich meant reuniting with my long-time friend and short-time coach, Dana. This was the first time a coach had accompanied me to a Diamond League Final. Her companionship, humor, and just plain NORMAL presence in my life was the perfect recipe for success. We joked around throughout my warm-up process, I stayed loose, and then I got third and threw further than I ever have before in Europe. What do you normally do? How can you combine your regular life and optimal performances? Maybe you have this experience too: Youâ€™re at practice, maybe you donâ€™t feel great physically (youâ€™re tired, you didnâ€™t sleep well, you have a lot to do later, etc. ), so mentally you know just to focus on technique that day. Youâ€™re relaxed because youâ€™re tired and not expecting a whole lot, and then a throw or component of technique surprises and thrills you early in the training session! I absolutely love that. So you try harder, and it falls apart. Thatâ€™s the lesson. The other lesson is not to panic. You can get it back! I did this a lot. I saw their attention as pressure. Itâ€™s not. Itâ€™s encouragement. A fix: Practice pretending that there are spectators! Invite people to practice who arenâ€™t usually at practice. Even have them heckle you if you think itâ€™ll help! Give yourself a scenario that involves visualizing a giant stadium and lots of noise, or a super intimate venue with people close to the runway if thatâ€™s whatâ€™s intimidating. Exercise your mind so youâ€™re practicing putting up with that attention until itâ€™s second nature. Maybe you have a hard time leaving your past failures there. It might haunt you that you didnâ€™t throw far enough that one time, or multiple times! Iâ€™ve been there. I watched other people get their game faces on and be celebrated for it, so I thought I needed to do that, too. Maybe thatâ€™s you (the serious person), but itâ€™s not me. I need to relax and have a great time to throw far. Thereâ€™s just that one person that either gets under your skin or seems to find some little extra gear to clip you at the end, repeatedly. It feels unfair and out of your control! A fix: Visualize your victory over this particular competitor in practice. Come up with detailed scenarios involving that one person that you can overcome in training, and lean on that practiced confidence in competition. â€œSally is ahead of you by 15cm going into the fifth round. You havenâ€™t executed X cue so far. Go.â€� â€œYou improved by 20cm, but she passed you again by half a meter. Last chance.â€� Reinforce your technical cues within that framework instead of just relying on emotional energy (you can do both). I GET IT. Unfortunately we canâ€™t force these things. Focusing on distance alone tightens me up! A fix: Watch video of your PR if you have it. Identify the technical things that you did correctly. Remember in detail what happened and how you felt that day. What other things in life cause you to feel the same ways? What kinds of emotions run through you and how do you channel them when you throw far? Try to do things that illicit those emotions and that energy on the days of your competition. Pinpointing the technical stuff that went well allows you to focus on an actual technical goal in the midst of a meet instead of getting caught up in hoping for numbers. Then when everything comes together itâ€™ll happen! I believe!!!! This has been blog one of this week, and both will cover your mindset going into competition. Blog two on the same subject will be a simple Q&A from Instagram questions Iâ€™ve gotten! So submit those or drop a comment below if thereâ€™s something youâ€™re wondering about after reading above. Thanks!